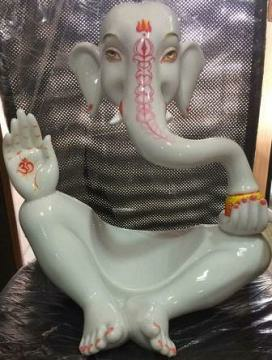 A very unique modern & contemporary artistic design Ganesha figurine for your home. Crafted by a team of skilled artists using makrana marble. Ideal for any place in your home to bring the blessing of Lord Ganpati for your daily or occasional worship. Present this beautiful Makrana Marble Ganesh idol to your loved one on any auspicious occasion to make them feel special. Dimension: 15 x 11 x 18 (Inch) Approx. Buy Abstract Style Artistic Makrana Marble Ganesh Idol Statue - 18", sold & shipped by Little India where you can shop online for Traditional Indian Gifts, Handicraft, Decor, Mandir & Murti. This Large Ganesha Statue collection has been tagged as big Ganesha Idol, Statue, Home decor, housewarming Gift, hindu religion, Religious, Abstract Art figurine, large Makrana Marble deity. Artistic Black Metal Large Ganesha Statue w/ Base - 26"